A very sicilian speciality with strong arabic influence (one of many of the multicultural heritage of sicilian cooking). 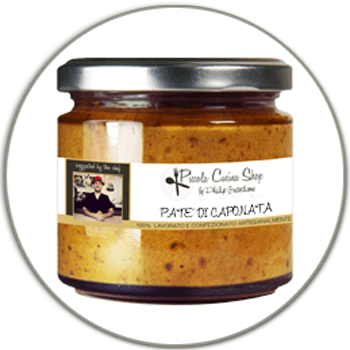 Raw materials of highest quality are important for the tipical and full bodies taste of a true sicilian caponata. The different vegetables are each cooked separately just to the point. In a last step they are joined together in a large frying pan and given the finishing touch by adding just the right amount of vinegar and sugar. Serve cold ot at room temperature. Delicious with white toasted bread. Serve with grilled meat as a vegetable dish. And why not serve with cheese Fondue or Raclette.